Jim Petrizzo, a financial adviser at Boulder Dam Credit Union, has been named to the senior adviser leadership team with the company’s broker-dealer, CUNA Brokerage Services Inc. The distinction is awarded to a limited number of financial advisers registered with the company who demonstrate exceptional sales productivity success, leadership within their credit union and among their peers, and have seniority at the broker-dealer. In addition to providing input and representing fellow advisors, Petrizzo will serve as an ambassador for CBSI and its advisers across the country. Petrizzo is a 40-year resident of Southern Nevada and lives in Boulder City. He is an investment adviser repesentative for the credit union. His wife of more than 30 years, Michelle, is part of his team at the credit union, as is his daughter, Dominique. His other daughter, Chelsea, is a registered nurse. Former Boulder City resident Cmdr. 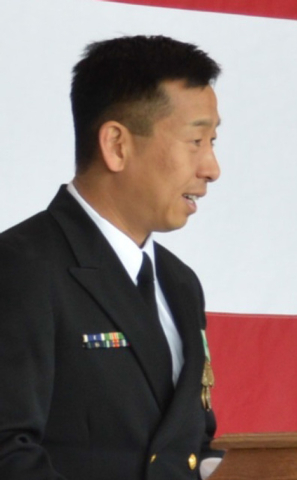 Samuel Y. Hanaki relieved Cmdr. Thomas M. Santomauro as commander of Air Test and Evaluation Squadron Three Zero (VX-30) at Point Mugu Naval Base in California on Feb. 26. Rear Adm. Paul A. Sohl, commander of Fleet Readiness Centers, was guest speaker for the change in command ceremony. Established in May 1995, Air Test and Evaluation Squadron Three Zero is a weapons test squadron. Its mission is to provide research, development, test and evaluation of unmanned, fixed- and rotary-wing aircraft and weapons systems and to support the Sea Test Range locally and worldwide. Hanaki lived in Boulder City from 1982-’86 with his family and was involved in the community. He attended elementary and junior high school here. His mother worked as a librarian and his father worked for the National Park Service at Lake Mead National Recreation Area and volunteered as a Boulder City firefighter/emergency medical technician. His sister was a track and basketball player at Boulder City High School and his brother was valedictorian the year he graduated. His parents have since retired and live in the city. Erin Warshefski, who is studying anthropology at San Diego State University, was named to the dean’s list for the fall 2014 semester. The dean’s list recognized academic achievement. To be eligible, a student must be in good academic standing, and have a grade point average of at least 3.5 based on a minimum of 12 units of credit.